It is not a book but a 200-Plus pages of a roller-coaster ride. People start disappearing mysteriously in all major cities of the world and without any trace. Few days later, they start appearing back equally mysteriously but are not the same anymore. They have converted ........ into ZOMBIES ..... cannibalistic monsters, frenzied, with heightened physical abilities but reduced mental capacities .... and, yet, they work together in groups, kill enough to satisfy their hunger and convert the rest to increase their strength. Police forces and armies use snipers to blow their brains off completely but it turns out that the virus does not spread merely by their bites; there is another way but by the time it is found out, it is too late. Their number increased to more than half-a-billion and all the countries decided to launch full-scale attacks against the armies of the converts that have taken over major cities and main population centers. With multiple big and small battles, it turned into a world war; a war that united the whole world for the first time in history. The war stretches from 2036 to 2040. 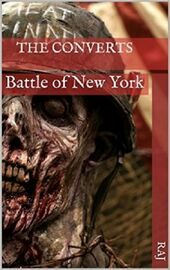 There are furious battles like Battle of New York, Battle of the Five Lakes, The Great Indian Battle and the Battle for SFO. Will humans be able to stop the 'Converts' from taking over the world or lose everything? Did the infection originate on its own or was there something else behind the spread? Will humans be able to find out the mystery behind the infection? A three-book series full of surprises and heroic battles that isn't merely for zombie-lovers but even for those who live for Thrillers, Sci-Fi and fast-paced action.